“Mangrove forests form the best natural defence for low-lying areas like the Sundarbans. These trees adapt to salinity and therefore can provide significant stability and protection to the shorelines,” says professor Amalesh Choudhury before taking a leap into the boat. The professor has arranged a journey out on Chayergheri river to the sea front of Sagar Island. One cannot believe that he is 86 years old, his energy and enthusiasm considerably out pacing the accompanying 30 year olds. He is an authority. In his company it is hard to imagine that anyone else could possibly know more about mangrove forests. 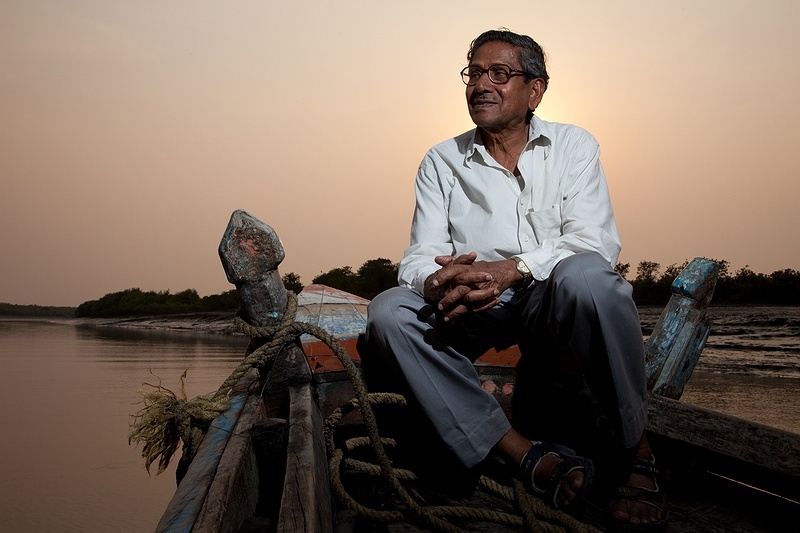 Professor Choudhury has dedicated his life to the subject, helping to gain UNESCO world heritage status for the Sundarbans in 1987. It has been no less than a lifetimes work, but at 86 he won’t give up. "Extreme weather events like cyclones and storms have become more common. Global warming is one reason for this, but personally I am an optimist and think it will take at least 100 years till this island is fully under water. Till then we have to do what we can to prevent a catastrophe." Sundarbans is home to the endangered Bengali tiger, the estuarine crocodile and the Indian python. Such a complete and extensive mangrove forest can’t be found anywhere else in the world. It is morning high tide, the water washes waist deep around the mangroves and the people fishing along the river. Mangroves are home to a myriad of different aquatic species and organisms, co-dependent on each other and important for the entire food chain. Rising tidal surges, cyclones, logging and pollution from industries further up the Ganges is affecting the life of the Sundarbans mangrove forest. "Heavy metals are passing up the food chain from small insects to fish, birds and finally people," says Amalesh Choudhury. In 1966 Choudhury established the Sagar Marine research Institute on Sagar Island and ten years later he started a mangrove restoration program to protect the coastal area of Sagar island. The initiative got support from the Indian government and UNESCO, but the money was only enough to cover some of the most vulnerable creeks and shorelines with mangrove plantations. However, increasing tidal surges and the expansion of a port on the other side of the Hooghly river changed the water surge and took away the natural path of silt that builds and protects the west part of the island. "Twenty-five years ago there were mangroves in more places than today. Many have now disappeared which makes the islanders very vulnerable to climate change disasters such as increasingly severe cyclones," says the professor. The cost of planting protective mangroves around the island and educating people of their importance could be achieved for an estimated 80 000 euros, a relatively low cost in view of the protection afforded by the mangroves. "The few hundred thousand population living here will otherwise lose their land and livelihoods, it will be washed away by the sea and their homes with it," says Choudhury. He continues, "if we get the money, local people would be involved in planting and nursery maintenance, preferable women from minority groups who have lost family members and are struggling to survive. It would create employment and give hope back to the islanders."